Glenn and Sean from FundInvoice LLP need your help. We would very much appreciate you help, and we are very grateful to those that have already provided a testimonial. You don't need to be a customer, if you are a funding partner, or a reader of our blog or magazine, you can still provide a testimonial. It is very much a case of quality over quantity as well, which is good news when you are a small firm up against many other much larger organisations. We are particularly grateful to those that provided us with a copy of their testimonial that we can use on our website. 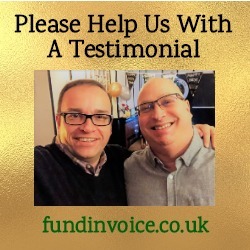 If you could email any that we can use to info@fundinvoice.co.uk as well as using the testimonial form above, it would be very much appreciated. You can read about how we made the shortlist of Finalists for this award here: FundInvoice Finalists 5 Years Running. Average cost saving found for customers of 34% of fees quoted elsewhere. 97% success rate at finding funding for customers. Average customer rating of 4.9 stars out of a possible 5. Over £10 million of funding found for customers. We have conducted, and shared - free of charge - an extensive archive of invoice finance related market research. We have used this research to help shape the products and services offered by many of our funding partners.